Tri-County Technical College (TCTC), along with Apprenticeship Carolina™, works with several local manufacturers to offer apprenticeship opportunities in advanced manufacturing. For companies like United Tool and Mold, Greenfield Industries and others, training the next generation of skilled workers begins in high school. Hoke Durham appreciates the opportunity to be a part of that workforce. “The apprenticeship showed me what I wanted to do with my life,” said Durham. “I never thought I would start my career at age 16. I thought I would be flipping burgers as a teen. I never dreamed by age 18, I’d be an apprentice tool maker at United Tool and Mold while pursuing a degree at Tri-County Technical College.” A 2015 Scholar Technician scholarship from Alliance Pickens and the tuition reimbursement program at United Tool and Mold are enabling Durham to attend TCTC debt free while he studies Mechatronics. Officially opened in Fall 2015, Central Carolina Technical College’s (CCTC) Advanced Manufacturing Technology Training Center (AMTTC) is a 90,808 square-foot, state-of-the-art industrial training and education center. This training facility houses classes in Mechatronics Technology, Engineering Graphics Technology, and Machining and CNC Technology. In addition, the AMTTC contains a suite for Continental Tire, a simulated work environment in lean manufacturing for Caterpillar and readySC™. 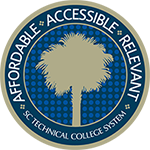 As an integral part of the SC Technical College System, readySC works together with CCTC to partner with industries considering a relocation or expansion in the local area. In both classroom and lab settings, the AMTTC offers the most advanced technology, training and equipment available. Students learn from experienced professionals who refine problem-solving skills and promote critical thinking using real-world projects. Through local industry apprenticeships, partnerships and on-site labs, students receive the hands-on training that is necessary for job placement. For the 2014–2015 school year, the average job placement rate for AMTTC programs was 91 percent. Companies who employee AMTTC program graduates include: APEX, Builders First Source, Caterpillar, Color-Fi, Continental Tire, Eaton, Kaydon, Mancor, Nucor and Suominen. 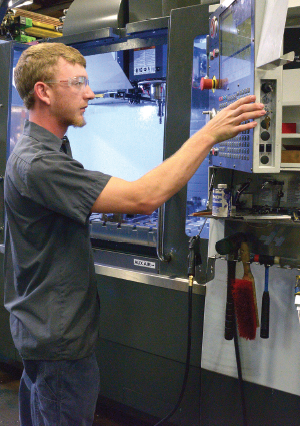 Trident Technical College (TTC) Industrial and Engineering Technology programs prepare students for a variety of jobs in advanced manufacturing. An advisory committee of local employers provides guidance on skills that are needed for employment, and labs allow students to practice the hands-on aspects of the job as well as work as part of a team. Recognizing industry’s demand for more skilled labor in the region, coupled with a need for an alternative career pathway for high school students, community leaders in Charleston came together to establish a manufacturing sector partnership and develop the region’s first U.S. Department of Labor Youth Apprenticeship Program in 2014. The sector partnership includes high schools in all four local school districts, TTC and a consortium of industry partners. It represents a community-wide collaborative approach to developing a comprehensive career pathway that provides a seamless transition for students from secondary to post-secondary education into the skilled workforce. Some of the local companies that employ grads: Bosch, Boeing, Hubner Manufacturing, Zeltwanger, IFA Rotorion, Scout Boats, Cummins, VTL Group, Aero Precision Products, TorqTek Design and Manufacturing. 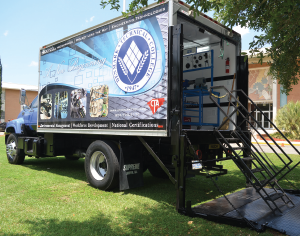 Denmark Technical College (DTC) brings advanced manufacturing training directly to local manufacturers through its Mobile Training Unit (MTU). The MTU is outfitted with technical training equipment, electrical and pneumatic power as well as Wi-Fi. Programs that are currently being offered on plant sites include: Industrial Maintenance (Electrical-Mechanical), Certified Production Technician, Certified Logistics Technician, Process Technician and STEM Awareness. Department of Labor Apprenticeship credential and any one of DTC’s Institute of Advanced Manufacturing certificates without ever leaving the plant. 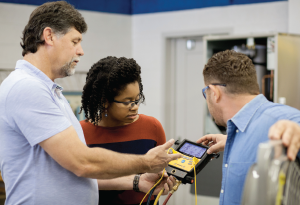 Aiken Technical College’s Center for Energy and Advanced Manufacturing provides students with the skills they need to be successful in an evolving industry that requires a highly-skilled and knowledgeable workforce. The 35,000-square-foot facility was dedicated in September 2015, and includes four classrooms, five bays, meeting space and faculty and staff offices. The state-of-the-art center has a flexible design to allow Aiken Tech to create learning environments that can accommodate changes as industries’ needs and workforce expectations evolve. Graduates of Aiken Tech’s advanced manufacturing programs have been hired by companies such as Bridgestone, Michelin, AGY and Hubbell, just to name a few. Greenville Technical College (GTC) is partnering with Clemson University (CU) to create the Gene Haas Center for Manufacturing Innovation (CMI). The number-one goal for the CMI is to increase the number of skilled workers for manufacturing in order to close the skills gap that has hampered the progress of many Upstate employers. 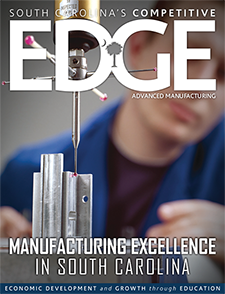 CMI brings many firsts to advanced manufacturing education. The involvement of CU as a partner, which is designed to bridge the gap between the education of the technician and the education of the engineer, is the first of its kind between a technical college and a research university in the U.S. This is not a shared location for separate offerings; instead, educational offerings will be integrated. A Manufacturing Honors College, which will allow GTC and CU students to work together to solve real-world manufacturing challenges, is also a first. 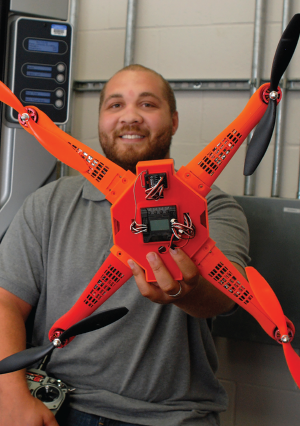 An additive manufacturing partnership with Renishaw at a technical college is another groundbreaking effort, and the open manufacturing lab for education, training and industry collaboration is unlike anything else in South Carolina. This campus is a first for GTC with its focus on one sector of the economy and contains the college’s first precision metrology lab. In response to industry demands, Horry-Georgetown Technical College (HGTC) will be constructing two new 25,000 sq. ft. Advanced Manufacturing Centers in Horry and Georgetown counties over the next several years. The manufacturing industry is recognized as one of the driving forces behind economic recovery and is essential to ongoing economic prosperity, while individuals proficient in the areas of advanced welding technology, machine tool/CNC and mechatronics are among the most sought after and highly paid workers in America. Midlands Technical College (MTC) recently opened its Advanced Manufacturing and Skilled Crafts Center. The center is the new home to many of MTC’s programs that prepare students for careers in advanced manufacturing and skilled crafts, such as Manufacturing Technician, Industrial Mechanics, Industrial Electricity, Industrial Maintenance, Mechatronics and Building Construction Technology. MTC invested $5.35 million in the building and equipment to better train a sustainable pipeline of technical talent to meet local industry’s skilled workforce needs. The facility has 13 labs for hands-on learning, a computer lab and five traditional classrooms. There is also a student atrium and common area. For years, the Center for Advanced Manufacturing and Industrial Technologies (CAMIT) programs at Spartanburg Community College (SCC) have employed talented instructors and provided modern, hands-on training resources to students. The result of which is highly skilled graduates for the Upstate workforce. SCC’s most popular program in CAMIT has been mechatronics — a program of study covering basic electrical and motion control applications. These applications are frequently used in industries with automated machining, assembly or material handling applications, such as our local partner, BMW. Enrollment for the mechatronics program is currently at the highest number ever for SCC, with 275 students in classes offered at four of the five SCC campuses. Orangeburg-Calhoun Technical College (OCtech) understands the need for a workforce trained for the changes that are coming to South Carolina. They are taking the lead in preparing students for excellent careers in advanced manufacturing. From robotics to smart machines and 3D printers, the OCtech campus is equipped with state-of-the-art laboratories. It also offers a KUKA KORE robotics certification. Programs give students the knowledge and skills necessary to help make industries world-class.